Three dogs in costumes, myself in "accented" clothing (including glittery eyelashes, which stayed on despite it being a hugely windy day), at the square in Prescott, after a pet costume contest. Yes, there were about 25-30 four-legged contestants. Here are our two vampires meeting another one, who also happened to be the winner. This tiny thing was Superman; he was incredibly cute. People really know what's best for their dogs, don't they? This little round pumpkin looked completely himself. And the little diva here seemed pleased with herself (by the way, hers is actually a girl's costume). A skunk and a ladybug. This guy was harder to understand at first. Once you saw that he was a shark, though, he was fun. I took a few pictures of these two because I was trying to get the best angle on their costumes; I never really succeeded. One is the now-classic hot dog; the other is carrying the headless horseman. An interesting event. Overall, though, it was a good example of pet ownership. Most dogs didn't have headgear, but those that did seemed comfortable with it. None of them were scratching or biting at their costumes. 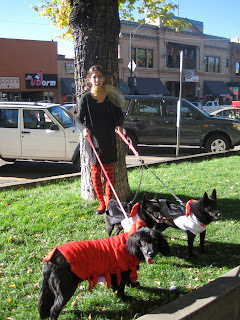 (Like our own lobster Molly: her costume had a hood, but we left it down because it just didn't work for her. It completed the costume, sure, but that's not a big enough reason). There was a brief bark-off when everyone first stepped into the middle, but after that, there was good behavior even with so many dogs in such close proximity. They all knew they're loved . . .